Office 365 E5 and EMS E5 trial or paid subscriptions. A simplified organization intranet connected to the Internet, consisting of three virtual machines on an Azure virtual network (DC1, APP1, and CLIENT1). You can use the resulting environment to test the features and functionality of Microsoft 365 Enterprise with additional Test Lab Guides or on your own. 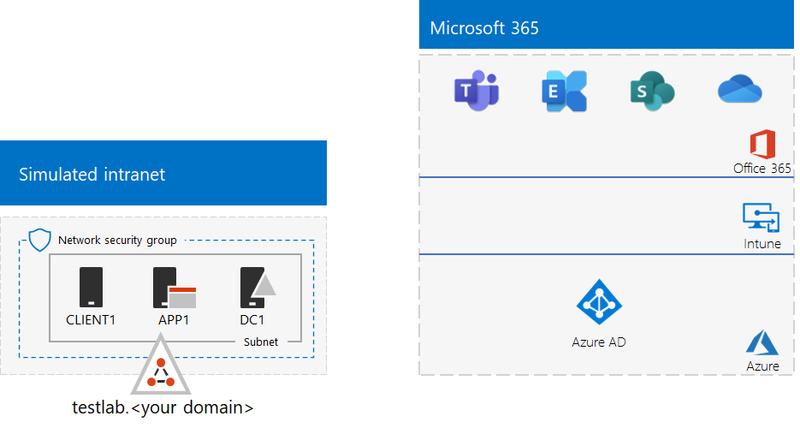 In this phase, you build a simulated intranet in Azure infrastructure services that includes an Active Directory Domain Services (AD DS) domain controller, an application server, and a client computer. You'll use these computers in additional Microsoft 365 Enterprise Test Lab Guides to configure and demonstrate hybrid identity and other capabilities. In this method, you use an Azure Resource Manager (ARM) template to build out the simulated intranet. ARM templates contain all of the instructions to create the Azure networking infrastructure, the virtual machines, and their configuration. The public DNS domain name of your test environment (testlab.<your public domain>). You’ll need to enter this name in the Domain Name field of the Custom deployment page. A DNS label prefix for the URLs of the public IP addresses of your virtual machines. You’ll need to enter this label in the Dns Label Prefix field of the Custom deployment page. After reading through the instructions, click Deploy to Azure on the template README page to get started. The simulated intranet built by the ARM template requires a paid Azure subscription. Here is your configuration after the template is complete. In this method, you use Windows PowerShell and the Azure PowerShell module to build out the networking infrastructure, the virtual machines, and their configuration. Use this method if you want to get experience creating elements of Azure infrastructure one step at a time with PowerShell. You can then customize the PowerShell command blocks for your own deployment of other virtual machines in Azure. In this step, we create an Azure virtual network and add DC1, a virtual machine that is a domain controller for an AD DS domain. First, start a Windows PowerShell command prompt on your local computer. The following command sets use the latest version of Azure PowerShell. See Get started with Azure PowerShell cmdlets. Next, create a new resource group for your simulated enterprise test lab. To determine a unique resource group name, use this command to list your existing resource groups. 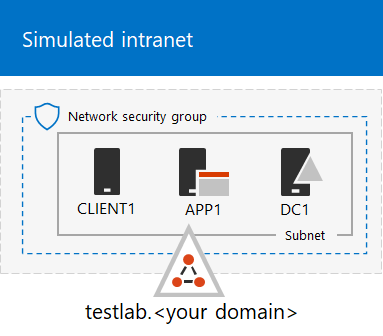 Next, you create the TestLab virtual network that will host the Corpnet subnet of the simulated enterprise environment and protect it with a network security group. Fill in the name of your resource group and run these commands at the PowerShell command prompt on your local computer. 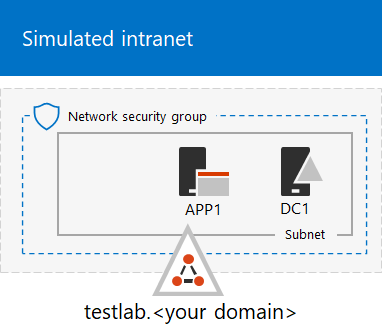 $rgName="<name of your new resource group>"
Next, you create the DC1 virtual machine and configure it as a domain controller for the testlab.<your public domain> Active Directory Domain Services (AD DS) domain and a DNS server for the virtual machines of the TestLab virtual network. For example, if your public domain name is contoso.com, the DC1 virtual machine will be a domain controller for the testlab.contoso.com domain. To create an Azure virtual machine for DC1, fill in the name of your resource group and run these commands at the PowerShell command prompt on your local computer. $cred=Get-Credential -Message "Type the name and password of the local administrator account for DC1." $vm=Set-AzVMSourceImage -VM $vm -PublisherName MicrosoftWindowsServer -Offer WindowsServer -Skus 2016-Datacenter -Version "latest"
You will be prompted for a user name and password for the local administrator account on DC1. Use a strong password and record both the name and password in a secure location. Next, connect to the DC1 virtual machine. In the Azure portal, click Resource Groups > [the name of your new resource group] > DC1 > Connect. In the open pane, click Download RDP file. Open the DC1.rdp file that is downloaded, and then click Connect. In the Windows Security dialog box, click Use another account. In User name, type DC1\[Local administrator account name]. In the Windows Security dialog box, click More choices, and then click Use a different account. In User name, type DC1\[Local administrator account name]. In Password, type the password of the local administrator account, and then click OK.
Next, add an extra data disk as a new volume with the drive letter F: with this command at an administrator-level Windows PowerShell command prompt on DC1. Get-Disk | Where PartitionStyle -eq "RAW" | Initialize-Disk -PartitionStyle MBR -PassThru | New-Partition -AssignDriveLetter -UseMaximumSize | Format-Volume -FileSystem NTFS -NewFileSystemLabel "WSAD Data"
Next, configure DC1 as a domain controller and DNS server for the testlab.<your public domain> domain. Specify your public domain name, remove the < and > characters, and then run these commands at an administrator-level Windows PowerShell command prompt on DC1. Install-ADDSForest -DomainName testlab.$yourDomain -DatabasePath "F:\NTDS" -SysvolPath "F:\SYSVOL" -LogPath "F:\Logs"
You will need to specify a safe mode administrator password. Store this password in a secure location. Note that these commands can take a few minutes to complete. After DC1 restarts, reconnect to the DC1 virtual machine. In the Azure portal, click Resource Groups > [your resource group name] > DC1 > Connect. Run the DC1.rdp file that is downloaded, and then click Connect. In Windows Security, click Use another account. In User name, type TESTLAB\[Local administrator account name]. Next, create a user account in Active Directory that will be used when logging in to TESTLAB domain member computers. Run this command at an administrator-level Windows PowerShell command prompt. Note that this command prompts you to supply the User1 account password. Because this account will be used for remote desktop connections for all TESTLAB domain member computers, choose a strong password. Record the User1 account password and store it in a secured location. Next, configure the new User1 account as a domain, enterprise, and schema administrator. Run this command at the administrator-level Windows PowerShell command prompt. 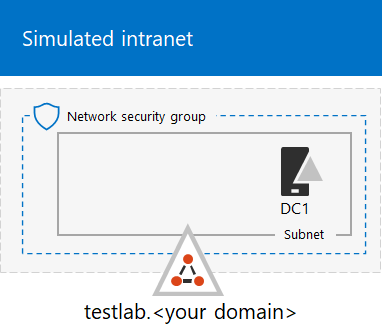 Close the Remote Desktop session with DC1 and then reconnect using the TESTLAB\User1 account. Next, to allow traffic for the Ping tool, run this command at an administrator-level Windows PowerShell command prompt. This is your current configuration. In this step, you create and configure APP1, which is an application server that initially provides web and file sharing services. To create an Azure Virtual Machine for APP1, fill in the name of your resource group and run these commands at the command prompt on your local computer. $cred=Get-Credential -Message "Type the name and password of the local administrator account for APP1." Next, connect to the APP1 virtual machine using the APP1 local administrator account name and password, and then open a Windows PowerShell command prompt. To check name resolution and network communication between APP1 and DC1, run the ping dc1.testlab.<your public domain name> command and verify that there are four replies. Next, join the APP1 virtual machine to the TESTLAB domain with these commands at the Windows PowerShell prompt. Note that you must supply the TESTLAB\User1 domain account credentials after running the Add-Computer command. After APP1 restarts, connect to it using the TESTLAB\User1 account, and then open an administrator-level Windows PowerShell command prompt. Next, make APP1 a web server with this command at an administrator-level Windows PowerShell command prompt on APP1. Next, create a shared folder and a text file within the folder on APP1 with these PowerShell commands. In this step, you create and configure CLIENT1, which acts as a typical laptop, tablet, or desktop computer on the intranet. The following command set creates CLIENT1 running Windows Server 2016 Datacenter, which can be done for all types of Azure subscriptions. If you have an Visual Studio-based Azure subscription, you can create CLIENT1 running Windows 10 with the Azure portal. To create an Azure Virtual Machine for CLIENT1, fill in the name of your resource group and run these commands at the command prompt on your local computer. $cred=Get-Credential -Message "Type the name and password of the local administrator account for CLIENT1." Next, connect to the CLIENT1 virtual machine using the CLIENT1 local administrator account name and password, and then open an administrator-level Windows PowerShell command prompt. To check name resolution and network communication between CLIENT1 and DC1, run the ping dc1.testlab.<your public domain name> command at a Windows PowerShell command prompt and verify that there are four replies. Next, join the CLIENT1 virtual machine to the TESTLAB domain with these commands at the Windows PowerShell prompt. Note that you must supply your TESTLAB\User1 domain account credentials after running the Add-Computer command. After CLIENT1 restarts, connect to it using the TESTLAB\User1 account name and password, and then open an administrator-level Windows PowerShell command prompt. Next, verify that you can access web and file share resources on APP1 from CLIENT1. In Server Manager, in the tree pane, click Local Server. In Properties for CLIENT1, click On next to IE Enhanced Security Configuration. In Internet Explorer Enhanced Security Configuration, click Off for Administrators and Users, and then click OK.
From the Start screen, click Internet Explorer, and then click OK. In the Address bar, type http://app1.testab.<your public domain name>/, and then press ENTER. You should see the default Internet Information Services web page for APP1. From the desktop taskbar, click the File Explorer icon. In the address bar, type \\app1\Files, and then press ENTER. You should see a folder window with the contents of the Files shared folder. In the Files shared folder window, double-click the Example.txt file. You should see the contents of the Example.txt file. Close the example.txt - Notepad and the Files shared folder windows. Use trial subscriptions of Office 365 E5 and EMS E5. The Office 365 E5 trial subscription is 30 days, which can be easily extended to 60 days. The EMS E5 trial subscription is 90 days. When the trial subscriptions expire, you must either convert them to paid subscriptions or create new trial subscriptions. Creating new trial subscriptions means you will leave your configuration, which could include complex scenarios, behind. Use a separate production subscription of Microsoft 365 Enterprise with a small number of licenses. This is an additional cost, but ensures that you have a working test environment to try features, configurations, and scenarios that does not expire. You can use the same test environment over the long term for proofs of concept, demonstration to peers and management, and application development and testing. This is the recommended method. If you must use trial subscriptions, follow the steps in Phase 2 and Phase 3 of the Office 365 dev/test environment. Next, you sign up for the EMS E5 trial subscription and add it to the same organization as your Office 365 E5 subscription. For a permanent test environment, create a new paid subscription with a small number of licenses. Next, repeat steps 8 and 9 of the previous procedure for all of your other accounts (User 2, User 3, User 4, and User 5). This is your final configuration.